Spectrum Center: LED Display Systems, Scoring, Integrated Digital and Static Signage, Control Room, IPTV, Sound Reinforcement System. Spectrum Center Team Store and Ticketing Booth: Experiential Design, LED Display Systems, AV System Design and Engineering. Spectrum Center Seating Bowl and Restaurant: AV System Design and Engineering. The new center-hung scoreboard, which is one of the biggest in the NBA, consists entirely of high definition electronic LED panels, with the screen forming the entire face of the scoreboard. The two sideline boards are the tallest in the NBA at 25.2’ high x 42.8’ wide, while the two baseline boards are 18’ high x 31.3’ wide. In terms of square footage, the sideline boards are 180% larger and the baseline boards are 50% larger than the screens on the previous scoreboard, providing Hornets fans with an enhanced game experience. The panels on the previous center-hung scoreboard each measured 16’ high x 24’ wide. Additionally, the new scoreboard has two underbelly screens measuring 9.8’ high x 16.5’ wide to provide a better view for those fans sitting in courtside and lower-level club seats. The underbelly screens are the largest in the NBA. In an effort to provide Hornets fans with the best visual experience possible, the new 1080p high-definition video displays boast a 70% increase in resolution from the former scoreboard, making the new scoreboard one of the highest-quality displays in the NBA. The scoreboard’s Hornets-branded elements make it one of the NBA’s most unique designs. The open-faced structure allows fans to see through to the scoreboard’s “hive,” the cell pattern cladding and branding within the board that connects the screens. Along with being a highly sophisticated and complex structure, the scoreboard serves as an artistic expression that represents the home of the Hornets. Through the addition of spider lighting technology, there is an ability to change the color of the lighting within the “hive” to any color, including the team’s iconic purple and teal. As part of the overall scoreboard project, the Hornets also added four corner-hung auxiliary boards in the upper level. Each board features a 16’ high x 26’ wide video screen in the center flanked by static signage on each side, with the goal of continuing to improve the fan experience for those in the upper level. The additional video boards, which are larger than the screens on the previous center-hung scoreboard, will keep fans closer to the action, provide additional game information and statistics and allow more branding opportunities for team partners. Additionally, new lower and upper fascia LED signage have been installed in Time Warner Cable Arena, providing the arena with two rows of 360-degree LED ribbon board. HORNETS’ NEW HD SCOREBOARD IS (WAY) BIGGER, (WAY) BETTER. The cheap seats at Charlotte Hornets games aren’t going to feel so cheap anymore. Not with the gigantic new state-of-the-art scoreboard now hanging over the court inside the Spectrum Center (formerly known as Time Warner Cable Arena), which will bring fans in the upper level closer to the action than ever before by way of razor-sharp screens that measure 42.8 feet wide and 25.2 feet tall on the sidelines and 31.3 feet wide and 18 feet tall on the baselines. The Hornets boasted at Friday’s unveiling that it is one of the largest and most high-resolution scoreboards in the league, and the NBA’s only board that displays images in true 1080p HD – which, in layman’s terms, means the Samsung screens provide the same quality and level of detail as the high-definition content produced by your Blu-Ray player. If those claims don’t mean anything to you but you’ve been to games in the past, consider this: The $7 million scoreboard is two to two-and-a-half times as large as the old, standard-definition board. It overwhelms the space, in a good way, turning the arena into “the biggest living room, likely, in Charlotte,” joked Pete Guelli, the team’s executive vice president and chief marketing officer. 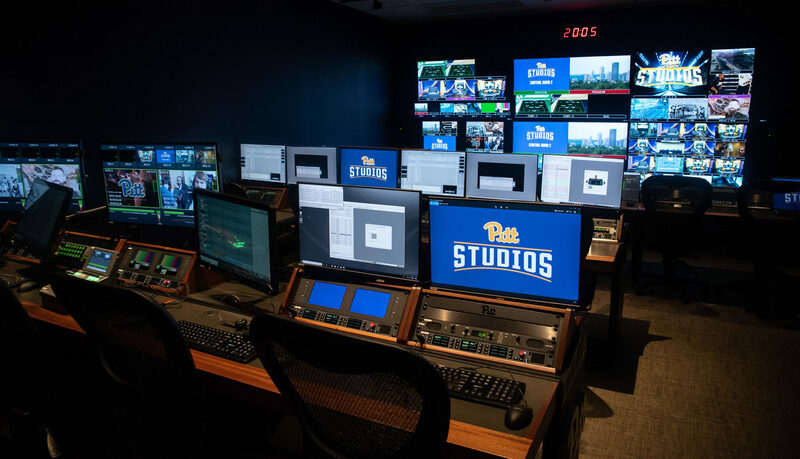 “It was really important for us to undertake this project, because it changes the perspective from the upper level,” Guelli said while members of the media watched the scoreboard churn out some (way) larger-than-life in-game demo material. For those down low, the new scoreboard features two “underbelly” screens measuring 16.5 feet wide by 9.8 feet high – these also come with the distinction of being the largest such screens in the NBA, and will simulcast what’s playing on the big screens. And whereas the old scoreboard basically just looked like a big box, the new monstrosity looks like something out of “Independence Day.” The underbelly also hides a “hive” that features the Hornets’ iconic pattern of honeycomb-shaped cells that on Friday glowed (what else?) purple and teal. It almost appears as though the whole thing could fold up like a Transformer, but the team says it simply can be raised in the same manner as the old scoreboard, for times when it needs to recede into the background a little bit more (during concerts or other non-sports events, for instance). 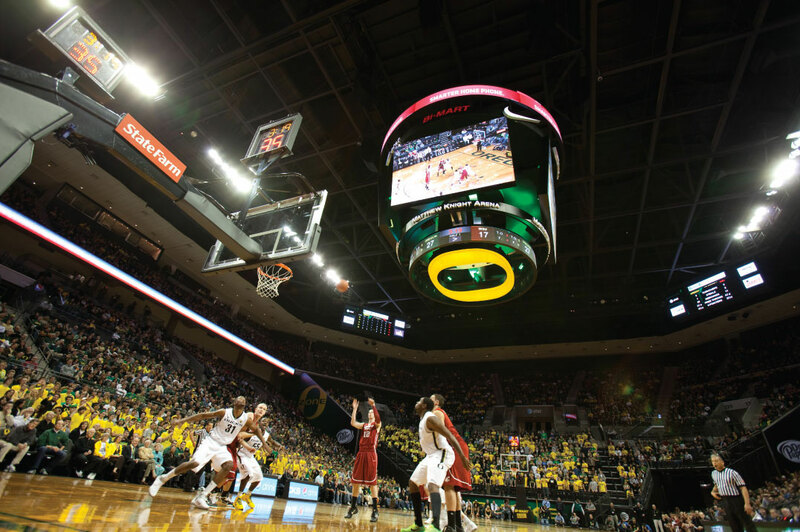 “We really believe that this is going to be the future of scoreboards,” Guelli said. “There are a lot of great boards out there – their quality is great, they’re massive in size – but nobody’s really taken it to the next level from the design standpoint. In addition, there are four new auxiliary corner video boards, each measuring 26 feet wide by 16 feet high, and new LED ribbon boards on both the lower and upper levels. The team is holding an open house from 6 to 8 p.m. Friday that will give fans a first look at the new scoreboard. Then the board goes live for the first time next weekend, during the Professional Bull Riders event. The Hornets’ first true preseason home game is on Oct. 10 against the Minnesota Timberwolves (they host the Boston Celtics at Greensboro Coliseum on Oct. 6); the regular-season home opener is also against Boston, on Oct. 29. Since Charlotte’s NBA franchise was rebranded as the Hornets two years ago, team officials have renovated and updated the features at Time Warner Cable Arena. With the arena set to host next year’s NBA All-Star Game, the next upgrade will be the biggest and most noticeable. Team officials said Wednesday that work will begin this summer on installation of a new center-hung scoreboard at Time Warner Cable Arena that will be one of the biggest and most unique in the NBA. 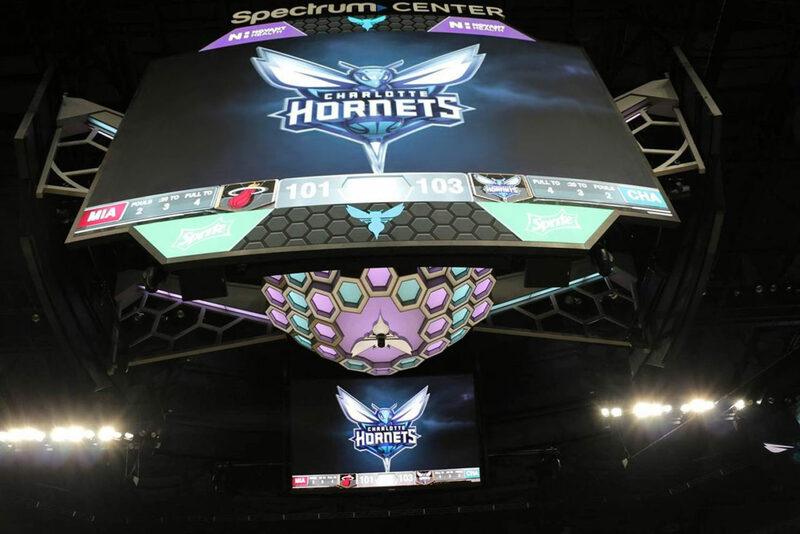 “We didn’t want to just hang a big scoreboard up there that looked like a box and just be the run-of-the-mill scoreboard,” Hornets Sports and Entertainment president and chief operating officer Fred Whitfield said. Work on the $7 million scoreboard project will begin in mid-July, with the arena shut down for about six weeks. Team officials said work should be completed in early September, in time for the start of the 2016-2017 NBA season. 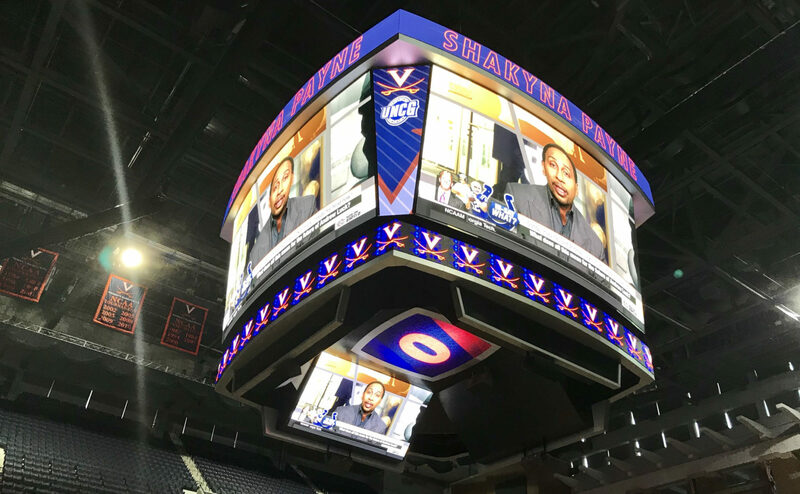 The new scoreboard is part of the second phase of renovations at Time Warner Cable Arena, where two new 360-degree LED ribbon displays and four auxiliary boards will be installed and where upgrades to suites, the visitor’s locker room and talent dressing rooms are planned. The scoreboard will consist of LED panels on all four sides – two sideline boards measuring 25.2 feet by 42.8 feet and two end-zone boards of 18-by-31.3 feet. It also will have two 9.8-by-16.5-foot underbelly boards viewable to fans sitting courtside. Team officials said the sideline displays will be 180 percent larger and the end-zone displays 50 percent larger than the current center-hung scoreboard displays, which measure 16-by-24 feet. The new displays also will feature 1080p-level high-definition resolution – a first for an NBA arena, according to HSE executive vice president and chief sales and marketing officer Pete Guelli. But what will make the Hornets’ new scoreboard stand out from the rest of the NBA is its design, Guelli said. The open-faced structure will feature elements comprised of a cell-patterned center element that resembled a hive, with the scoreboard displays connected to it by wing-patterned stanchions. The center elements also will have color-changing lighting. 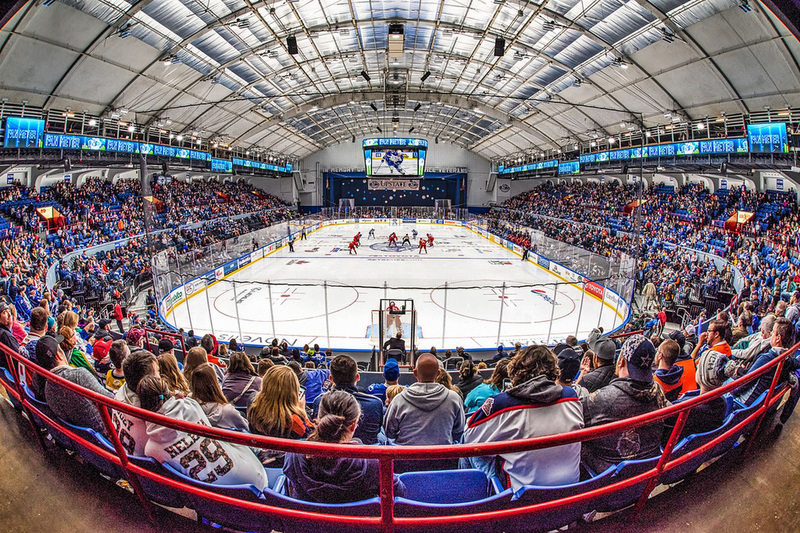 “When you go to other buildings, there’s some incredible boards with great resolution, some massive boards throughout the league,” Guelli said. “But you could drop them in any building in the NBA, and you wouldn’t be able to tell a difference. This truly reflects the Hornets’ DNA. Hornets-Branded Scoreboard Will be One of the Biggest and Highest-Quality Boards in NBA. The Charlotte Hornets today unveiled renderings of the team’s new center-hung scoreboard and four corner-hung auxiliary boards that will be installed in [Spectrum Center] Time Warner Cable Arena starting in July. The new center-hung scoreboard, which will be one of the biggest in the NBA, will consist entirely of high definition electronic LED panels, with the screen forming the entire face of the scoreboard. The size of the two sideline boards will be 25.2’ high x 42.8’ wide, while the two end zone boards will be 18’ high x 31.3 wide. The scoreboard’s square footage increase will be 180% larger for the sideline boards and 50% larger for the end zone boards compared to the team’s current scoreboard, providing Hornets fans with an enhanced game experience. The panels on the current center-hung scoreboard within Time Warner Cable Arena all measure 16’ high x 24’ wide. Additionally, the scoreboard will have two underbelly screens measuring 9.8’ high x 16.5’ wide to provide a better view for those fans sitting in courtside and lower-level club seats. The lone static graphic on the scoreboard is reserved for the arena’s naming rights holder, Time Warner Cable, at the top of the scoreboard. Also, the top and bottom of each board will have electronic tabs that will allow for additional partner branding. In an effort to provide Hornets fans with the best visual experience possible, the new high-definition (1080p) video displays will claim the most advanced and highest-grade LED components available today from Cree, Inc. Hornets fans will be introduced to one of the highest-resolution scoreboards in the NBA boasting a 70% increase in resolution from the team’s current scoreboard. The scoreboard’s Hornets-branded elements will make it one of the NBA’s most unique designs. The open-faced structure will allow fans to see through to the scoreboard’s “hive,” the cell pattern cladding and branding within the board that connects the screens. Along with being a highly sophisticated and complex structure, the scoreboard serves as an artistic expression that represents the home of the Hornets. Through the addition of spider lighting technology, there will be an ability to change the color of the lighting within the “hive” to any color, including the team’s iconic purple and teal. As part of the overall scoreboard project, the Hornets will incorporate four corner-hung auxiliary boards in the upper level. 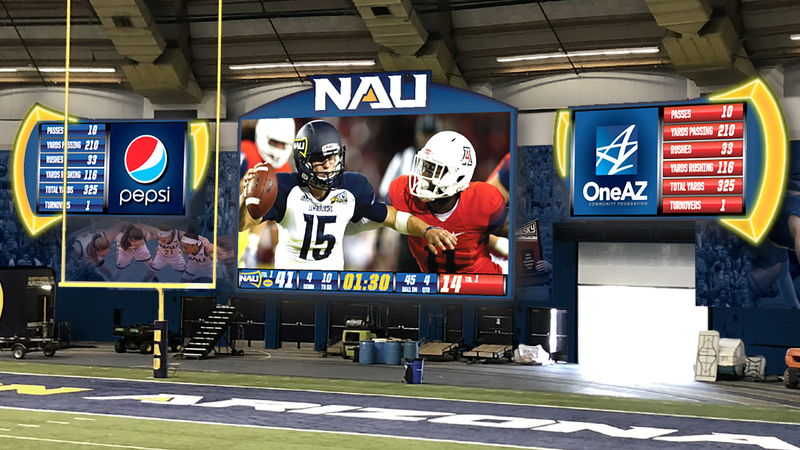 Each board will feature a video screen in the center flanked by static signage on each side, with the goal of continuing to improve the fan experience for those in the upper level. The additional video boards will keep fans closer to the action, provide additional game information and statistics and allow more branding opportunities for team partners. The corner boards are a one-of-a-kind engineering feat as they will be retractable with the ability to move up or down depending on the events within the building. Additionally, new lower and upper fascia LED signage will be installed in Time Warner Cable Arena, providing the arena with two rows of 360 LED ribbon board. 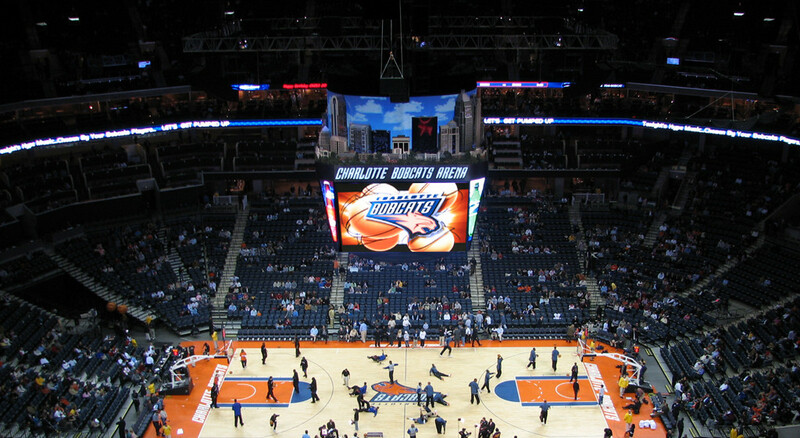 The scoreboard was designed by the Anthony James Partners (AJP) design team with approval and influence by the Hornets and the NBA. 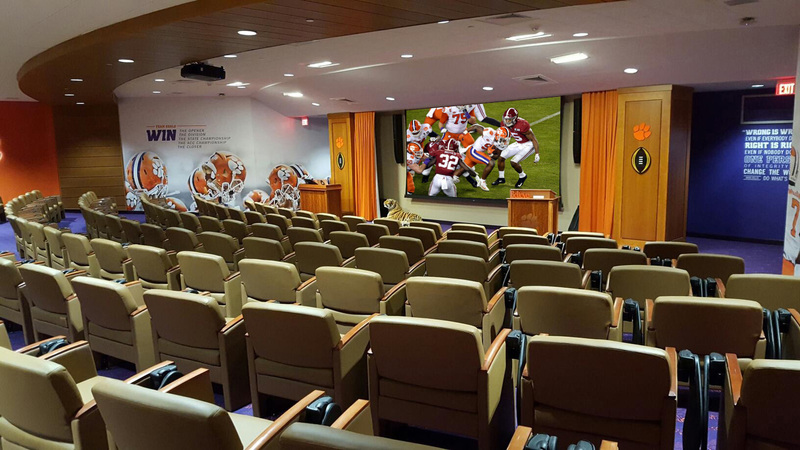 AJP is a worldwide leader in AV technology and has a track record of working with the highest-profile professional sports teams. The scoreboard will be constructed by YESCO Electronics, a division of Samsung Electronics and an industry leader in digital signage. Construction of the scoreboard is scheduled to start mid-July and run through the beginning of September. The scoreboard will debut in time for the start of the Hornets 2016-17 NBA season.